Nocxium is one of the most sought-after materials around, as it’s one of the vital ingredients for capsule production. Due to the fact that this strange matter forms only during supernovas, it can only be found in a few exclusive regions. As the nocxium breaks down when under intense heat and pressure, it only exists in asteroid fields and not in larger stellar objects. A few years ago numerous asteroids containing nocxium were discovered in the extensive Miennue cloud ring just outside the jurisdiction of the Gallente Federation, propelling the otherwise desolate cloud ring into the international political limelight. Thousands of prospectors have flocked to Miennue since nocxium was first discovered there, but as always only a handful reap the rewards of their efforts. Yani Sar Arteu was one of the few to hit the jackpot big time. 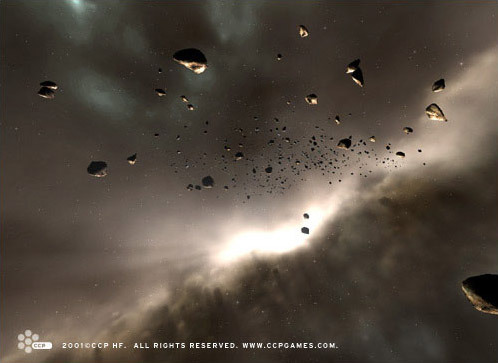 He and his small company named Outer Ring Excavations recently stumbled across an asteroid reportedly containing the biggest nocxium deposit ever found in this region. Although rumors abound nothing has been confirmed, as only Arteu and his companions have seen this alleged super-asteroid and are not about to disclose its location. In fact, they only spend the minority of their time actually mining the asteroid, hunting it down on weekly excavation expeditions. This is because they don’t want to flood the market with nocxium, thus bringing down the price. In between, they spend their energy playing elaborate games of hide-and-seek with jealous competitors eager to get their hands on the asteroid. The empires monitor the goings-on in Miennue closely and all of them have made both overt and covert proposals to Outer Ring Excavations, offering security for a stake in the company. Outer Ring Excavations have rejected all these offers, but ever-increasing pressure from competitors is making it harder and harder for them to keep their secret safe much longer. Sooner or later, one of the numerous methods employed by those pursuing the asteroid -- bribes, threats, tracking devices, bugs -- is bound to unveil the secret that Arteu has so meticulously kept concealed. In the meantime, Arteu and Outer Ring Excavations are getting richer -- fantastically so -- by the minute.